Are you a condiment person? Here’s an easy test: is there a shelf of your fridge (or three or four) jammed with little bottles and jars of sauces and oils and pickles and mustards and relishes and jams and chutneys and maybe, way at the back, an unopened jar of truffle butter that came from Italy, ahem, years ago? I love all those delicacies in little jars, so it’s no surprise that I’m a fan of Marisa McClellan’s Food in Jars website. 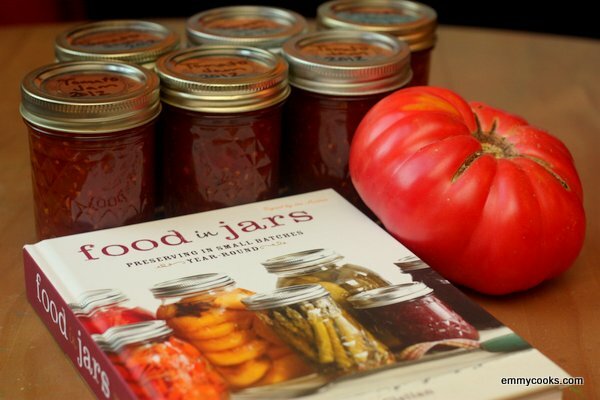 I bought the Food in Jars cookbook as soon as I saw it appear at Book Larder, and it has been a big part of my summer. First off, there was that Maple-Roasted Almond Butter we all loved, and then I consulted with Marisa (I mean her book) about jams all summer long–for the record, we see eye to eye. Marisa (I mean her book) even deserves the thanks for those candied cherries that I couldn’t bear to puree into cherry butter. See why I like her (I mean her book) so much? And that was before I made this tomato jam. When I met Marisa at the BlogHer Food Conference earlier this year, I asked which recipe I should make first from her book. She recommended this one. It took a while for Seattle’s tomato availability to catch up to my intentions, but better late than never. I’ll be making another batch of tomato jam this weekend, and you probably should plan on it too. It’s sweet and savory, robust yet refined, and just spicy enough. It’s the perfect condiment. So far we have loved this tomato jam with our Pound of Greens Frittata and with an excellent firm aged goat cheese. Marisa enjoys hers on a turkey burger. I can’t wait to try it in a grilled cheese sandwich. You get the picture. Start early in the afternoon. Find yourself a big bowl of fragrant tomatoes–I used a range of varieties that happened to be on my counter that day. Admire them as you chop them to bits. Pile a heavy pot full of tomatoes, sugar, lime juice, and spices. Cook slowly, uncovered, for a long, long time. Stir more often at the end; you’d hate to lose all that work to a burnt pot. I let my jam go for two hours. You want to cook it all down until the watery liquid is gone and the remaining stuff is tomato jam. You’ll know when you get there, but don’t worry too much; a little thinner or a little thicker will be perfect too. 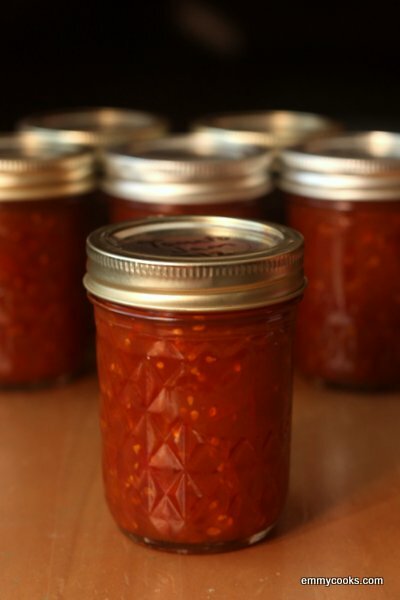 Sweet and Spicy Tomato Jam: In a large, heavy-bottomed pot, combine 5 lb. finely chopped tomatoes, 3 1/2 c. sugar, 1/2 c. freshly squeezed lime juice, 2 tsp. finely grated fresh ginger, 1 tsp. cinnamon, 1/2 tsp. cloves, 1 Tbsp. sea salt, and 1 Tbsp. spicy red pepper flakes. 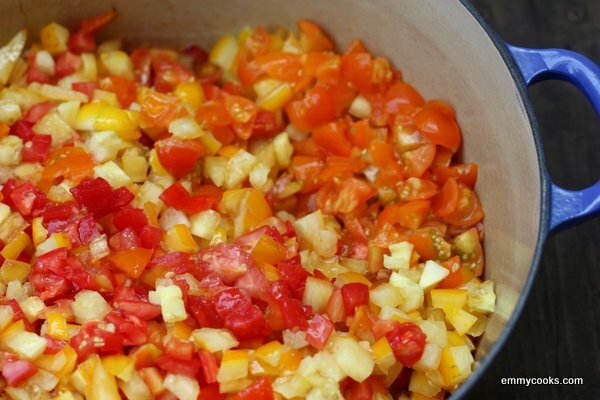 Bring to a boil then reduce heat to low and simmer, uncovered, until reduced to jam (up to 2 hours). If you are canning your jam in a boiling water bath, the processing time is 20 minutes. If you are not canning your jam, I am quite sure that you will find a way to eat or share it quickly. To enter, just leave a comment on this post. Maybe tell me about a favorite preserving recipe, or something you’d like to preserve, or anything about food you like to put in jars, and you’ll be entered to win. You may also enter up to three additional times if you follow Emmy Cooks on (1) Facebook or (2) Twitter or (3) if you sign up to receive daily updates from Emmy Cooks via email or your own RSS reader. Just leave a separate comment below for each entry (up to 4 total per person). Comments made before 11:59 p.m. (Seattle time) on Monday, Oct. 1 will be counted as entries. The winner will be chosen at random and will be posted to the blog on Tuesday, Oct. 2. The winner will have 48 hours to claim her/his prize by providing a mailing address; otherwise another winner will be chosen. Update 10/2/12: And the winner (chosen by random.org) is Lisa-Marie Haugmoen. Congratulations, Lisa-Marie! To those who didn’t win, you can order your copies here. This entry was posted in DIY, Food, Preserving, Recipes, Vegan or Would-Be-Just-As-Good-Vegan and tagged chutney, CSA recipes, giveaway, savory fruit recipes, summer recipes, tomato jam, tomatoes on September 27, 2012 by emmycooks. I hadn’t noticed this recipe in the book, will put it on my to-try list. I make an Indian-inspired tomato jam/chutney (think mustard seeds, ginger, and cumin) that I love so much. I’m sure this one is delish as well. I like the idea of lime in there. If you haven’t canned it, you could probably bring it back to a simmer and add the cumin in. I am such a sucker for cumin seeds (have you tried the ones from World Spice?). Yes, I am one of those people with jars filling all the nooks and crannies of my refrigerator. And, no I couldn’t possibly tell you the provenance or age of all said jars. But just don’t go about tossing them out, Marvin, because if I catch you, I’ll have a hissy fit. I am very new to the make it yourself in jars plan. My mom made stellar jams. My sister knows all the tricks of the trade in preserving goodness and making it betterness. Here is a recipe for Blackcurrant Jam that she taught me that holds up to the best of the best you can scoop from a jar. Love this post! I’ll have to try making it… next year (since I lost my remaining tomatoes to blight!). I got into canning a few years ago in some attempt to be a little self-sufficient. Now that I’m student teaching and have little income, we canned or froze almost everything from our garden. I even branched out, trying some salsa, blueberry syrup, rhubarb jam… I’d like to continue canning all winter. I must say my favorite are my dilly beans. There is nothing better than cracking open a can on Christmas eve. Vinegary, spicy, and crunchy. Perfect condiment (or snack!). This summer I have been roasting small batches of tomatoes and strawberries to use as pops of flavor on just about everything. I did make up several batches of tomato jam last summer and am planning on using this recipe this week for a batch. Big fan of the sweet/savory combo. This has reminded me to start buying 5kg boxes of end of season tomatoes. My parents used to call me The Condiment Queen and I’ve been known to plan a meal based on what condiment I felt having at a given moment! We happen to have a bunch of tomatoes (finally) on the windowsill so I think I’ll give this a whirl. Funny post, btw. You need to pick me or I won’t knit for you!!! :.)) I want this book!!!!!!! Please! Love your blog! Congratulations, Lisa-Marie–Random.org chooses you as the winner of the Food in Jars cookbook! I can’t wait to hear about what you make. Please send your address to emmycooksblog (at) gmail (dot) com so that Running Press can put the book in the mail to you! You know how much I like preserves :D. My current favourite being my apple chutney – delicious. Anyway, this one sounds equally amazing. I’ll have to try out a tomato jam! That tomato jam looks so yummy. I can’t wait to try it! I did my first canning this year – plum jam – it is delicious and makes for a nice gift for friends. fresh homemade jams are always so comforting… right? I would totally use tomato jam! Yum. A shelf of my pantry and most of my fridge door is filled with small bottles and jars of condiments, you just can’t have enough in my mind. Thanks for a great cookbook giveaway! I also subscribe via email, now, too. By the way, I am here because of the Seattle Blogger FB page. You know, I am not that much of a condiment person. I mean, mustard, yes! Always plenty of mustard at our house. But other than that, I’d probably go for full-on veg and pickles and etc on sandwiches. Thanks for the giveaway opportunity! I’d love to win this book! My daughter is starting to do some canning, and I’d like to share it with her. Sounds so delish! My first canning attempt is the pickled onion recipe below. Not very complex but the result is fantastic. This is a great giveaway! Yes, please! Enter me to win! Just this past week, I finally got around to starting to clean and organize my kitchen cabinets. I uncovered 6 jars of peach jam circa 2005! Not good anymore, but it did make me think that I should start canning again. Canning and putting the jars somewhere where I wouldn’t forget they were there! I just picked up huckleberries – first time – at the farmer’s market today and can’t wait to make jam. I also grabbed some 2nds on tomatoes to make this heavenly tomato jam here! My name is Janet and I am a condiment person. There is no room in my fridge for food for all the little jars of this and that, I have a friend who says I am the only person she knows who will spend all day making condiments and have no meal to put them on at the end of the day (she exaggerates slightly), and the noises my dear children make aside, there is no sound more delightful to my ear than the ping of jars fresh out of the canner. SO THE BOOK IS MINE. M I N E.
also I subscribe by email, natch. I am currently working my way through 100# of tomatoes into sauce. I still want to make salsa! Well, I’d like to preserve anything! I grew up with a canning mothe (jams, pickled peaches, pickles, stewed tomatoes, etc. ); but I’ve never taken the plunge. I did get this book from the library, just so I could see the other nut butter recipes after you recommended the maple almond one. I once had a June Taylor plum almond jam (or conserve?) that was the best jam I’ve ever had. (It may be partly that I first tried a taste outdoors at a farmer’s market.) I’d like to replicate that! What an incredible book! Entering! I want to can some plum sauce…. How did I miss this?? I haven’t canned…yet…but I do LOVE canning jars. I have them in all shapes and sizes. Does that count?? One day, I’d like make canned pie filling from scratch. There have been so many times when I just wanted some saucy apples and didn’t have apples or time to make them. Maybe this year I’ll make the time! I love canning pickles & fruit jams! I subscribed to your blog on my Google reader. I love to can roasted tomatoes and this year, fig jam! Pickled asparagus, orange marmalade, and cherry tomatoes are my favorite foods-in-jars, but I’m also a fan of anything crisp. It’s amazing how diverse and flavorful preserved foods have become again. Just got back into canning again this spring. Tomato crop was bumper this year, too. I saw Food in Jars on facebook post this link—and I wanted this tomato jam recipe. Then I saw…Book Giveaway! BONUS! I love making wine jellies using different varietal or blended wines and a complimentary herb from my herb garden. For example, a grassy, herbal Sauvignon Blanc paired with lemon thyme and lemon balm. Yum. I also adore green tomato chutney, by far the biggest single batch item I canned this year, as I had to rescue tomatoes before our first solid week of frosts! The tomato jam I did make used white/cream colored Ghost cherry tomatoes, basil, and apples. It tastes surprising tart and lemony, like lemon meringue filling. (I use no or low sugar pectin for everything as much as possible.) Delicious! I’m glad I found a new blog to subscribe to as well. I’ve been looking for a way to can basil pesto. Is it possible? Also looking forward to trying a charoset-inspired apple preserve! I just picked a ton of apples, and decided to play hooky from school today so I can make apple sauce, apple butter and more pie. And I just used up the last of our basil for pesto. Winter will be delicious this year! I have recently decided that canning should be my new hobby. I am taking a class starting next week and am excited to get started. But I have a last batch of tomatoes in my fridge and now I know what to do with them. Thanks! just picked up a bunch of pears to make a batch of Pear Vanilla Jam… also from Marissa! This recipe sounds fabulous! Do you peel the tomatoes or just leave the skins on? Spicy and Sweet Tomato Jam is indeed my favorite. I made them this summer from tomatoes harvested from our backyard “farm”….. oh, what a delightful result. My family loved it so I will be making some more!! I recently made a tomato jam recipe passed along from a friend. She told me she got it from Food in Jars. I’ve been considering buying the cookbook ever since. This would be a great opportunity to try out some more wonderful recipes! Thanks so much Emmy Cooks for doing this give-a-way! This sounds so good – gonna make some for sure! This is actually my favorite recipe to can! I made this last summer & couldn’t get enough of it! I have some to make tonight! I’d love to pickle okra! And I can’t wait to try this chutney. Thanks for sharing! My favorite preserve is the Green Tomato Relish recipe from Lucy Norris’ “Pickled.” I make it every year when the rain comes and it’s clear those green tomatoes will never ripen. And I love it so much I can hardly bear to give it away! I’d love to make (and am planning to, soon!) watermelon jelly from her blog! YUM! I’m now subscribed to your blog in my RSS feed! I just got into canning and am loving the ideas on your blog! I am adding this jam to my list to try next year. I am a true-blue condiment person (1/3 of my fridge and a major portion of my pantry devoted to condiments-condiments-condiments!). I can’t wait to try this! This is my first year to can in a large way, so have mostly just done the basic. The best is oven roasted salsa–so smokey and yummy. I would love to branch out more next season and can dream of pouring over the recipes in this lovely book during the cold winter months. I just subscribed :-)…looking forward to learning more. Ah, too bad I missed this one. But I’ve been seeing this cookbook here and there – I guess I’ll need to go pick one up :) I always want to can more than I actually end up canning but once I’m doing it it’s so much fun! My favorites are the tried-and-true: tomatoes and berry jams. We are really enjoying the plum jam I made this year, too – plums, honey and a bit of orange. It’s awfully winterish but we can’t help ourselves! I just started canning in September and so far I have ‘put up’ sweet & spicy pickles, crushed Roma tomatoes, basil & garlic pasta sauce, spicy apple & pear butter! Next I want to can homemade vegetable soup and sweet curried zucchini pickles. I have definitely become a food in jars foodie! I’m so happy to have found your blog, via Food In Jars. I am a keeper of small jars in the ‘fridge and freezer. My favorite currently is vanilla/ginger/pear jam I made last winter. Love, love, love canning in winter when it helps to warm me up on a cold afternoon. I have a large pile of home grown tomatoes on my kitchen counter which will be turned into this tomato jam tomorrow! I’m just a newbie, “jarring” basic things like green beans, various jams, salsa, but I think this Sweet and Spicy Tomato Jam looks like something I should try to make! I just added you to my FB friend list! Just added you to my Strymr rss reader! .. and followed on FB. Looking forward to seeing what you got cooking next! I watched my sister do her canning the other night and now I’m hooked. This book will help me a lot. I hope I win…. My wife will put this book to good use – she just started canning and so far she’s done really good. Apple Ginger Jam is our favorite. I love drunken fruit of any kind all preserved and cozy in canning jars! Great treat for the deep VT winter evenings! And I’m getting your emails now too! I made this jam for the first time this year after reading about tomato jam last year when all the canning blogs were atwitter about it. Before I saw that, I had thought, tomato jam? That sounds kind of gross, like ketchup, but with even MORE sugar. But it turns out it is wonderful. If I were to make it again, I might cut back on the cloves just a tad. But it is well worth making. I reduce mine in a “lid cracked open” crock pot. Would love a copy of the book. Apologies for the very late reply, but I hope your tomato jam thickened up as it cooled. I don’t drain my tomatoes for this recipe and always find that they become “jammy” after cooking down and even thicker after cooling. I hope you had the same experience and enjoyed a great result after all that stirring!